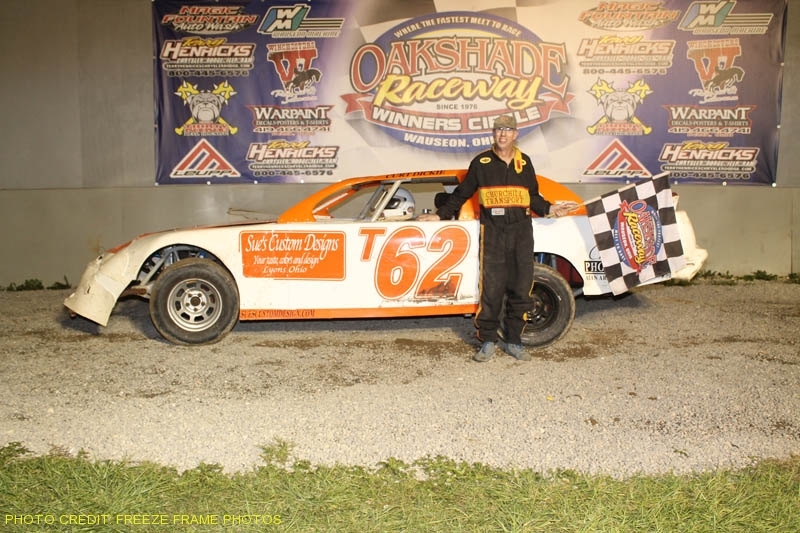 Oakshade Raceway kicked off its 33rd year of top notch dirt track racing with a weekend full of racing excitement. Brian Fisher, Jim Scout and Dylan Herman were Bill Reckner Memorial trophy winners on Saturday night and Ron Bloomfield took the checkered flag on Sunday afternoon’s 200-lap enduro race. The Bill Reckner Memorial UMP Sportsman feature was the featured event Saturday on the 3/8 mile high banked dirt oval. Twenty-four cars took the green flag with Rusty Smith jumping out to lead lap one after starting on the pole. Brian Fisher wasted no time getting to the front by making a three-wide pass for the lead under Amy Bernard and Rusty Smith on lap two after starting inside the third row. Fisher tried to open a lead over the rest of the field, but multiple cautions for spins kept the field tight. Bruce Stuart appeared to be on the move, having worked up to third, but spun shortly after a restart for a late caution knocking him out of contention. Fisher proved to be the class of the field holding off Tim Line to win the first feature event of the season. Defending Oakshade UMP Sportsman Champion Mike Jessen finished third followed by Brett Miller in his first Sportsman feature after moving up from the UMP Bombers this year. Steve Mills was fifth. Ron Tolles held off Danny Hogrefe to win an exciting heat race earlier in the night and found himself starting on the pole for the Bill Reckner Memorial UMP Bomber A Main. Tolles jumped out to open up a big lead early, but Jim Scout began to close in. Jerry Signor, Brad Miller and Rick Dippman tangled on the backstretch on lap seven ending their night earlier than anticipated. The yellow flag for the incident allowed Scout to close right up to Tolles’ rear bumper for the restart. Addison, Michigan’s Jim Scout made short work of Tolles, taking over the lead one lap later and went on to pick up the easy victory. Tolles fell off the pace shortly after losing the lead and retired to the pits ending up 14th. Danny Hogrefe started 12th and worked his way up to finish second ahead of Dan Shaffer, Jamie Grochowski and Ron Bloomfield. The night marked the beginning of the sophomore season for the brand new UMP Hornet four-cyclinder division for younger drivers aged 12 to 18. The Bill Reckner Memorial Hornet feature event produced one of the most exciting finishes of the night. Drew Smith started from the pole and assumed the early lead. Bowling Green, Ohio’s Dylan Herman closed in and went around the high side to take the race lead on the second lap. Smith managed to hang with Herman, not letting him open up too much of a lead. Meanwhile, Casey Noonan who had spun on the first lap with a little help, worked himself back up to third. Smith closed in and dove to the inside of race leader Dylan Herman in the final set of corners with the checkered flag in sight. The two drivers were side by side in turn four, but Herman managed to edge out Smith for the victory coming off turn four up high. Adam Noonan, Curtis Spurgeon and Derek Morris rounded out the rest of the top five finishers. The Bill Recker Memorial Night was capped off with the UMP Bomber B and C Mains. Karl Spoores, Rick Dixon and Ron Leonard heated things up in the B Main, mixing it up early for the lead. Once things shook out, Dixon found himself in the lead and never looked back. Rick Dixon won easily over Ron Leonard, Bob Mayer, Karl Spoores and Chris Sands. Tony Tolles took command early in the UMP Bomber C Main with Fred Burtch running second. Curt Lancaster squeezed by Burtch to take second, but had made a bit of contact with Burtch trying to avoid a lapped car. The contact cut down a tire on Burtch’s car, ending his good run. Lancaster proceeded to catch Tolles and made an exciting last lap pass to the inside of Tolles in turn four as they came to the checkered flag earning him the victory. Tolles had to settle for second with Dan Plath third and Josh Overmyer fourth. Craig Turner finished fifth. Sunday afternoon marked the first of four scheduled enduro events of the season with a newly announced point series for the enduro drives. Trophies will be awarded at the end of the season for the top three in points. Ryan Desgrange was the early leader of the 200 lap event, but quickly fell back through the running order after the 25 lap mark. Chris Williams then took over with consistent laps and managed to stay out of trouble. Trouble found him though shortly after completing 75 laps when his right rear wheel came off as he exited turn four. That prompted the only stoppage of the race as his car sat right near the groove facing oncoming traffic. Williams spent many laps in the infield and somehow managed to get his wheel back on enough to allow him to drive back to the pits to make more permanent repairs. Brad Gilbert then assumed the lead by the halfway point and continued to lead a close race over Ron Bloomfield until he got within the final 50 laps. An apparent fuel line issue caused Gilbert to lose power forcing him to the pits while Bloomfield took the lead. Gilbert got his car going again and came back out on to the track at least 10 laps behind the race leader. Bloomfield’s equipment held together and made it the distance to win the Sunday afternoon enduro race. Gilbert had completed enough laps to finish a distant second followed by Chris Osborn, Jeremy Grover, and Chris Williams who salvaged a fifth place finish. The next enduro race is scheduled for June 7, 2009. Racing resumes Saturday at Oakshade Raceway with the 2009 debut of UMP Late Model action, along with the UMP Sportsmen, UMP Bombers and UMP Hornets. Gates open at 4pm with racing at 7pm.